Does it ever seem like everybody else in the world has figured out how to start an online business…except you? Maybe you have a goal, a wish, a deeply held desire or dream…and you’d love to make money online. Or perhaps you’ve been stuck in a job you hate for far too long, or even worse, don’t have a job. Could be you’re trying to retire, but are scared spitless about how you’ll have enough money to have any kind of options in life at all. From time to time you even contemplate the idea that if others are doing it, maybe you could too. Well, I’m here to tell you, it most definitely is NOT too late. And I should know, because I’m practically a text book example of “late bloomer!” More about that in a minute. Actually, the fact you’re here reading this right now leads me to believe that inner voice has not been completely silenced, and there’s an entrepreneurial spirit in you just begging to get out! I’m going to prove to you that ALL of these scary, overwhelming, paralyzing feelings and thoughts can be vaporized faster than you may have thought possible. You are perfectly awesome because you ARE…you just are. Not broken. Not lacking. Not less. Created one-of-a-kind, with the heart, soul, and warrior-woman strength to be ALL you are meant to be. And I’d be honored to help you find your way! Hey there! I’m Tina Lorenz. I’ve been working location independently from “world headquarters” in Arizona, my mobile office, and at one point even a second home in San Miguel de Allende, Mexico, for more than 15-years. And now, I’m on a mission to help other entrepreneurs and bloggers discover exactly how powerful you can be, by making what you already know, love, or are passionate about into a profitable, sustainable, and scalable online business. Ever since I discovered how to create a service-based business online, I’ve generated multiple millions of dollars in profits for my clients, as well as an extremely profitable business for myself. I literally came out of nowhere, completely unknown in the world of online marketing, and starting from scratch, made six figures my first year online. When I began, I was absolutely certain, I could do it. That inner voice literally had me breaking out in a cold sweat when I discovered my first profitable online business, copywriting. I was so determined, we actually sold our humble mobile home in Yuma, Arizona, to raise some start-up money so I could begin. With the encouragement of my husband Ron, I bet on myself. From that first six-figure year, it just kept growing as I continued to build a tremendous online business. I worked from anywhere, completely location independent, while we pursued our passion for the RV lifestyle. We remodeled several homes in Arizona, selling them for a profit when we were ready for the next adventure. We spent two years living in Central Mexico, a cherished time that was both fun and exciting. I became the go-to person for 7-figure online launches, and worked with many extremely successful online marketers, many of whom you would probably recognize. I also created several training programs of my own, selling for as much as $5,000. And it just keeps getting better! Pretty awesome, right? This is truly the most important element, and the driving force behind my passion for creating The Renegade Boomer blog. Because without YOU, there’s no point to any of this. So, let’s rally! It’s Never Too Late to Create The BEST Years Of Your Life! I suspect you may have a few arguments running through your head even as you read these words. Perhaps you’re ready to defend and protect your current (misguided!) belief that you simply cannot do it because (fill in the blank of your current justifications here). I didn’t start with ANY kind of advantages whatsoever. I grew up in an extremely scary, dysfunctional family setting. I literally climbed out my bedroom window when I was 17-years-old, and began living on my own in Seattle. I went to court to get emancipated, and began taking care of myself. I went through an emotionally abusive 18-year marriage. After my divorce, I narrowly avoided being murdered in a terrifying domestic violence situation with a true psychopath, and ended up homeless with two children to support. And I didn’t have ANYONE to turn to. I just had to figure it out and survive. Eventually I met my soul mate Ron, and we married. Ron happens to be legally blind, and navigates with a guide dog. And YES! That means I do all the driving of my 45’ Renegade mobile office! In fact, I highly recommend being a renegade, a warrior, a THRIVER, not a survivor…that’s the inspiration for this blog! You don’t have to settle into some pre-ordained, expected, cookie-cutter path someone else has chosen for you, or EXPECTS of you! No matter what curve balls life throws at you, you can triumph! Together, Ron and I built a life from scratch, with nothing of value to our names. Thankfully I had my biggest blessing through it all, my two children. And along the way, I discovered I really DID have something to offer the world…just like you will discover for yourself too. But here’s the very best part of all. I didn’t start doing what I do now, until I was into my FIFTIES! I’ve never actually told anyone this before, and I have to admit, it makes me a bit nervous to be this transparent. But it’s important that you know this! Yep, when you look up the definition of “late bloomer” you’ll find my photo front and center. 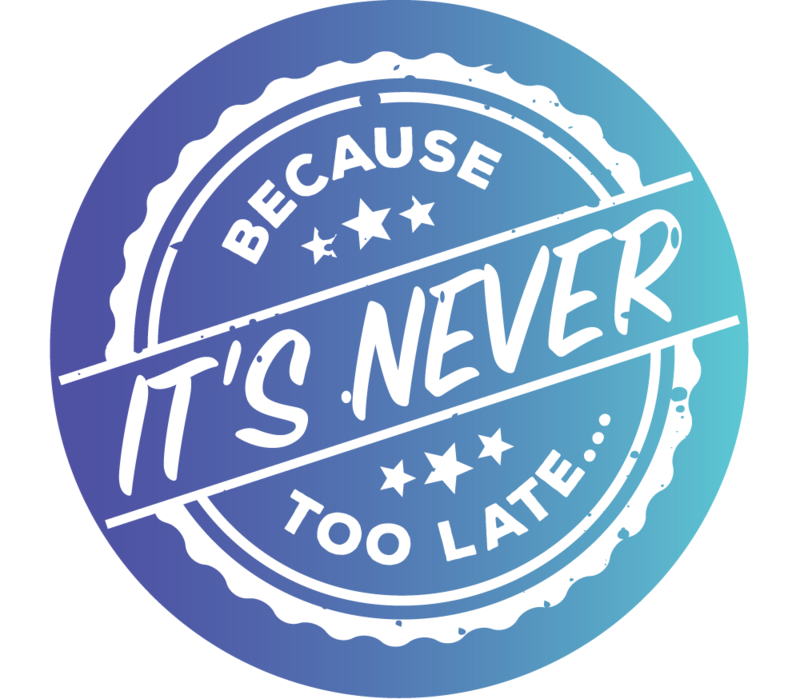 I discovered, just like you will, that it is NEVER too late! You just have to WANT it. BELIEVE in yourself enough to TRUST yourself. Find a trusted mentor you can relate to and LEARN from. And you can truly discover who you were really meant to be all along. If A Formerly Homeless Woman & A Blind Guy Can Do It…So Can You! I’m here for you. So, let’s get to it! For starters, if you’ve already caught the vision, and would love to take the first step, I recommend you create your own blog. And don’t worry! You can do it without all the techie headaches and hassles when you start right here. Believe me, I’m totally NOT a techie! So, I created a way to make this super simple for you. You’ll find step-by-step, detailed instructions right here so you can literally overcome any resistance or confusion about how to start a blog. I’ve coached complete newbies who have had their blogs up and running within ONE day! It really can be done. Remember, you don’t have to struggle along on you own. You’ll find a supportive home here. If you’d like to go on this journey with me, you can sign up for ongoing updates, smart strategies, tips, and “brain cleanses” to support your success. You’ll also get invites to any free workshops or trainings I’ll be doing. They’re pretty valuable, so you probably don’t want to miss them. Just fill out the form, and click the button to sign up! Remember, you don’t have to try and figure this out all by yourself. I’m here for you!